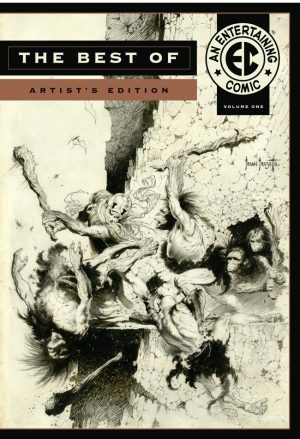 The Best Of EC: Artist’s Edition Volume One features original art from most of the top creators of what’s considered the top comics line of the 1950s. The exceptions are Jack Davis and Wally Wood. Stories written by Ray Bradbury, Harlan Ellison, Harvey Kurtzman, Jack Oleck, Carl Wessel, and Al Feldstein are adapted by Johnny Craig, Al Williamson, Alex Toth, Harvey Kurtzman, Bernie Krigstein, and Joe Orlando, giving a comprehensive sample of EC art, drawn at the massive ‘twice-up’ size of 15″ x 22″ (381 x 550 mm). These vintage art pages have been photographically scanned in colour at very high resolution and reproduced actual size, on heavyweight paper. This process produces the sensation of looking at original drawings exactly as created by the EC artists with all the pencil marks, corrections, different pens and inks, production notes and other artefacts visible. As with all these volumes comprised of vintage art pages, there is variation in paper colour and line densities as the effects of age cause the paper, ink and stuck-on tones and lettering balloons to change in differently unpredictable ways. Johnny Craig art is featured in two stories: ‘Touch and Go!’ from Crime Suspenstories 17 and ‘Whirlpool’ from Vault Of Horror 22. He also has three covers, to Crime Suspenstories issues 20 and 22, and Vault Of Horror 32. The sole Roy G. Krenkel tale is ‘Time To Leave’, from Incredible Science Fiction 31. Bernie Krigstein art features in four stories: ‘More Blessed To Give’, from Crime Suspenstories 17; ‘Catacombs’, from Vault Of Horror 22; ‘The Flying Machine’, from Weird Science-Fantasy 28; and ‘Slave Ship’, an unpublished story that only exists in pencilled form. There are four stories and five covers featuring the art of Harvey Kurtzman: ‘High Tide’, from Crime Suspenstories 1; ‘Corpse On The Imjin!’ from Two-Fisted Tales 25; ‘Henry And His… Goon-Child’, from Weird Fantasy 15; and ‘Man And Superman!’ from Weird Science 6. The covers are Frontline Combat 5 and 7, Two-Fisted Tales 21 and 22; and Three-Dimensional EC Classics 1. 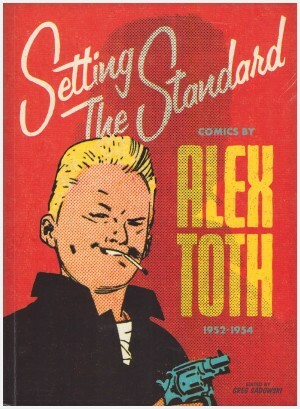 Joe Orlando is the artist for two stories: ‘Judgement Day’, from Weird Fantasy 21, and ‘Bum Steer’, from Weird Science 15, and Alex Toth art is featured in ’Thunderjet’, from Frontline Combat 8. There are five stories drawn by Al Williamson: ‘The Champion’, from Valor 2; ‘By George! !’ from Weird Fantasy 15; ’50 girls 50’, from Weird Science 20; ‘Upheaval’, from Weird Science 20; and ’A Sound of Thunder’, from Weird Science-Fantasy 28. 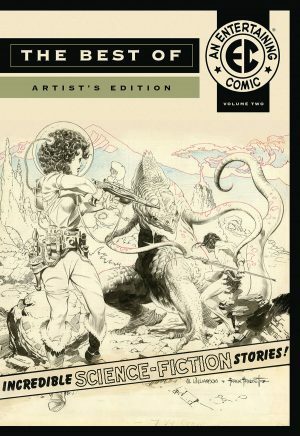 There is also the one cover by Williamson for Weird Science-Fantasy 25, and five additional covers: Al Feldstein for Tales of Terror Annual 3, Weird Fantasy 15 and 17; Frank Frazetta for Weird Science-Fantasy 29, and Wally Wood for Weird Science 22. 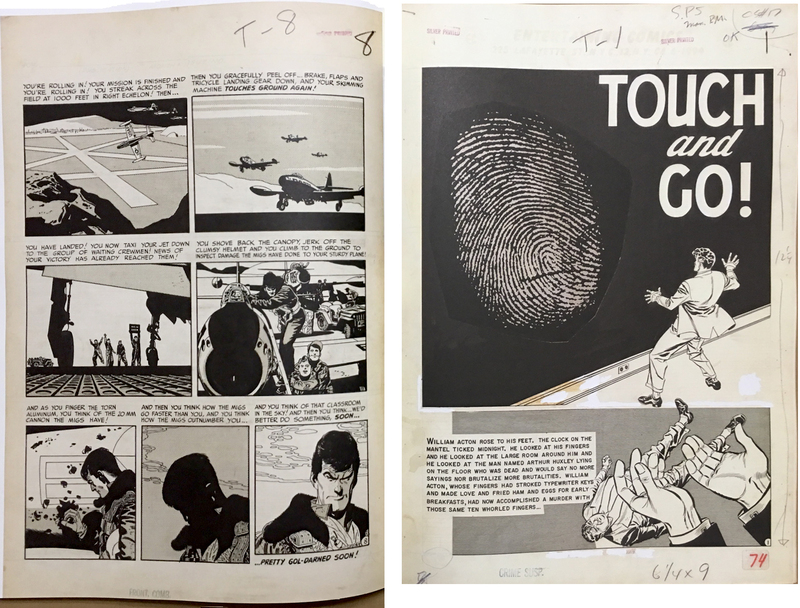 One final brilliant inclusion in this collection is the endpapers which feature an illustration by Marie Severin of the EC bullpen. Her typically detailed and funny drawing mimics the styles of the artists she depicts here. 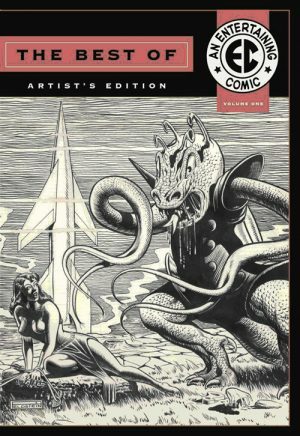 This is an excellent selection of original art from some legendary comics artists. 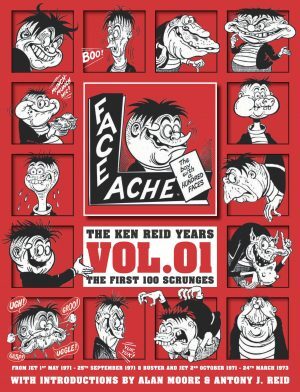 Fans of strips from this period will want to see this, and volume two is even better.